Her 2013 Chachapoya F Cria! The legend! deceased.... NGG Accoyo Apache II! Apache is virtually a legend in the suri world. Some would say he is "the Best" suri herdsire in the country. Certainly he has a sterling reputation. 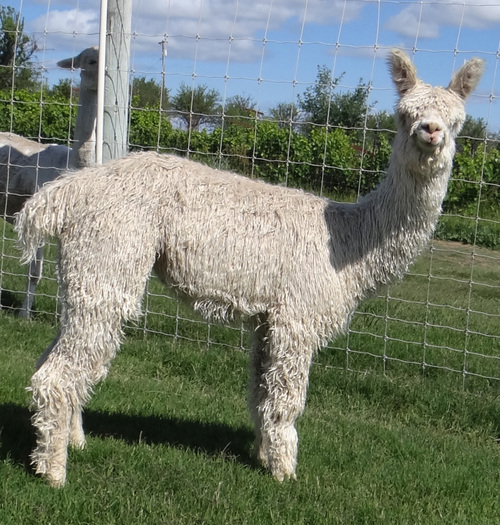 For parents he boasts 2 of the finest suris that were ever imported into the US, both owned by Nola Graham of NGG Alpacas: Pperuvian Uribe--the first colored full Accoyo suri in the US-- and Ppperuvian Dulcinea--a dam so fine that Nola paid a premium for her. Later, Greg Mecklam of Pacific Crest bought Apache, and has taken him to his current status of fame. Full Accoyo daughter of the late great Accoyo Bruxo, who was one of the truly greatest impact suri herdsires in North America. 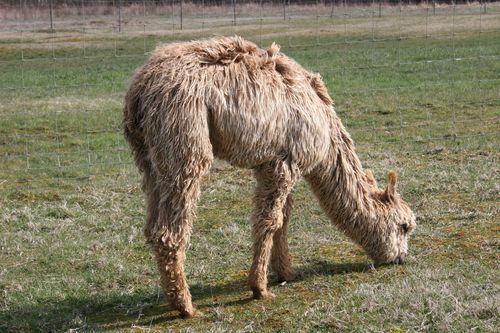 Iris's dam Eluteria, otherwise known as "Beauty" - a stunning MF Suri import who birthed a living legacy of crias including several champion herdsires (DDF Accoyo Maurizio, DDF Accoyo Armani, Peruvian Accoyo Gold. 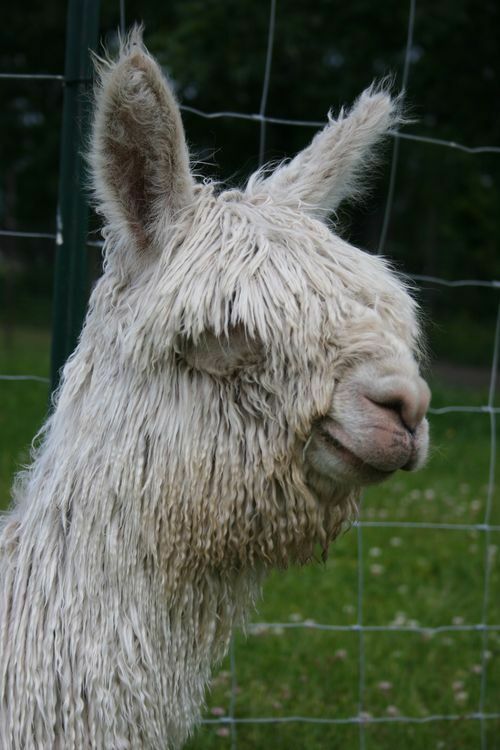 GFF Accoyo Princess Olympia is a large, big-boned suri alpaca dripping with fine, lustrous locks. A sterling example of the power of pedigree, Full Accoyo Olympia's grandsires are none other than the late greats PPeruvian Bruxo and PPeruvian Uribe (Durazno). 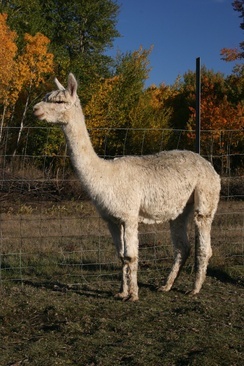 Olympia's sire is the well renowned Accoyo Apache II - Apache is virtually a legend in the suri world. Some would say he is "the Best" suri herdsire in the country. Certainly he has a sterling reputation. 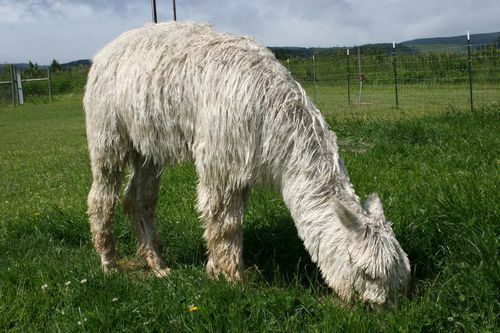 For parents he boasts 2 of the finest suris that were ever imported into the US, both owned by Nola Graham of NGG Alpacas: Pperuvian Uribe--the first colored full Accoyo suri in the US-- and Ppperuvian Dulcinea--a dam so fine that Nola paid a premium for her. Later, Greg Mecklam of Pacific Crest bought Apache, and has taken him to his current status of fame. Oympia's dam is the lovely DDF Accoyo Princess Isis..Full Accoyo daughter of the late great Accoyo Bruxo, who was one of the truly greatest impact suri herdsires in North America. Iris's dam Eluteria, otherwise known as "Beauty" - a stunning MF Suri import who birthed a living legacy of crias including several champion herdsires (DDF Accoyo Maurizio, DDF Accoyo Armani, Peruvian Accoyo Gold). Olympia's ciras have been great, take Good Fortune's Accoyo Litsa who was the very best Full Accoyo suri to grace Good Fortune's farm. Sired by the legendary Full Accoyo stud Woods Edge Accoyo Baron Lafite, Litsa was awarded 1st place Light Juvenile Suri at the 2008 CABA show and also won First and Judge's Choice, Best Hand at the 2008 CABA Fleece show. Litsa is now part of the production herd at SuriPaco in Maine - and you KNOW that Claudia can pick em.